Decorate your interiors in an interesting manner with this classy showpiece featuring the figurine of Lord Krishna with Goddess Radha. Apart from being worshipped, this amazing showpiece can be placed in your living room or in your office. The statue is made up of Brass red & blue stone finish with a protective coating over it. Decorate your interiors in an interesting manner with this classy showpiece featuring the figurine of Lord Krishna with Goddess Radha. Apart from being worshipped, this amazing showpiece can be placed in your living room or in your office. The statue is made up of Brass adorned in a brown gold antique finish with a protective coating over it. Decorate your interiors in an interesting manner with this classy showpiece featuring the figurine of Lord Krishna with Goddess Radha. Apart from being worshipped, this amazing showpiece can be placed in your living room or in your office. The statue is made up of Brass gold finish with a protective coating over it. 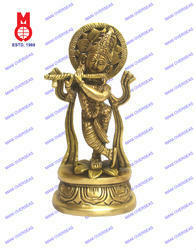 This brass idol of Lord krishna, is meant for performing puja at your home, or for simply decorating your home in Hindu way . According to the Bhagavata Purana, which is a sattvic purana,asserts that Krishna is “Bhagavan Himself,” and subordinates to itself all other forms: Vishnu, Narayana, Purusha, Ishvara, Hari, Vasudeva, Janardana, etc.Krishna is often described and portrayed as an infant or young boy playing a flute as in the Bhagavata Purana,or as a youthful prince giving direction and guidance as in the Bhagavad Gita.The stories of Krishna appear across a broad spectrum of Hindu philosophical and theological traditions.They portray him in various perspectives: a God-child, a prankster, a model lover, a divine hero, and the supreme being.The principal scriptures discussing Krishna’s story are the Mahabharata, the Harivamsa, the Bhagavata Purana, and the Vishnu Purana. He is also called as Govinda & Gopala.